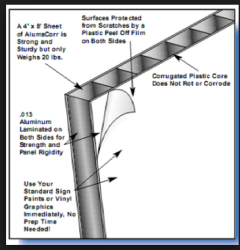 Lightweight, yet sturdy, aluminum is a great choice for outdoor signs. It comes in a variety of colors, and features a baked enamel finish that is highly durable for withstanding the elements without rusting. Be careful when installing your aluminum sign (or have Sign Central install it for you). While the baked enamel finish is resistant to weather, it is brittle and scratches easily. 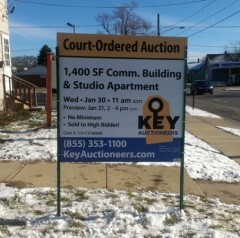 Sign Central Site Signs generate awareness and create interest for your properties with on-site signs. Ideal for construction sites or commercial businesses, large site signs colorfully convey your message and provide availability information so your prospective tenants or purchasers have all the information they need. 10 mil coroplast is a great temporary, cost–effective option for site signs. 10 mil coroplast site signs are great for public hearing signs, construction site signs, “For Lease” or “For Sale” signs, and auction signs. 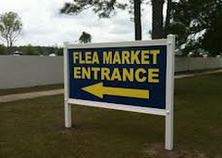 Max–Metal signs are an affordable alternative to wood and alumacore signs. This lightweight, yet durable aluminum composite material is the flattest panel material. Max-Metal is weather resistant, making it perfect for long-term, exterior signage. Max-Metal is ideal for high-quality digital and screen-printed graphics or photo mounting, and is perfect for industrial signage, point-of-purchase displays, and real estate signage. Maxmetal also comes in a brushed metal finish. 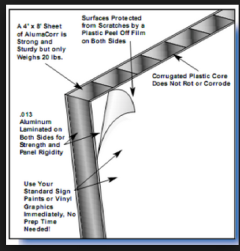 Alumacore site signs are a professionally crafted product made of a corrugated copolymer core with a laminated .013 aluminum surface on both sides. Alumacore, like our other panels, cuts easily using standard woodcutting tools. Alumacore is a fantastic substitute for medium density overlay (MDO) wood or aluminum signs. It is rigid like MDO board, with a smooth aluminum and baked enamel finish on both sides. It is fairly lightweight but has a much harder surface than MDO board, so it resists scratches, and it lasts outdoors for 10 years! Wood site signs are created on the best quality medium density overlay (MDO) exterior plywood. These signs are extremely durable, highly versatile, and are ideal for commercial, industrial, land, and retail applications and these custom signs can be made in any size to your specifications. Some common sizes are 18″ x 24″, 2′ x 3′, 2′ x 4′, 4′ x 4′ and 4′ x 8′. Each custom sign is primed, painted, and sealed to protect it from the outdoor environment. These signs can be screwed or nailed through and brackets can be used to attach these signs to posts or to a wall.